The main objective of our events is to offer the new comer a direct appreciation of the richness of the local culture and of the cultural diversity of Luxembourg. 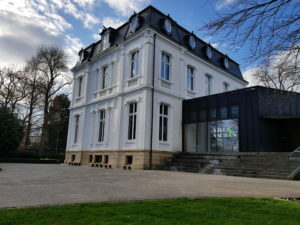 The integration meet-up events are held in 3 main cultural institutions of the City of Luxembourg: the Villa Vauban, the Lëtzebuerg City Museum, the Cinémathèque. During the meetings people have the opportunity to discover the beautiful architectural spaces and exibitions of the museums and watch ancient movies picked up from the rich archives of the Cinémathèque. Each event is conceived with a similar structure but always proposing a different intercultural animation. After a small guided tour of the museums we gather in groups to follow a short ice-breaker work-shop around an integration theme. Cinémathèque – short ice-breaker game about non-verbal communication. For instance in the past events, we have worked on the Luxembourgish language (typical expressions), we have used specific intercultural cards to investigate the psychological issues implied in the transition from country to country. 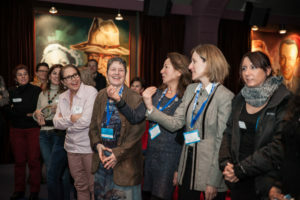 We then had a short animation about non-verbal communication after having watched a silent movie at the Cinémathèque and in the last event, at Villa Vauban, we have focused on women as integration drivers and models. At the last event in Villa Vauban the two short guided-tour in English and French focused on a selection of artworks dedicated to women or created by women. The tour took the visitors through both the Steichen permanent collection and the temporary exhibit dedicated to Paula-Modershon Becker. After the short visit, which we hope will entice people to return to the museum for a longer tour, we have gathered around some nice food prepared by Elisabeth is in the Kitchen and drinks, to kick-off the networking-animation session. Some of our ambassadors took the microphone to present to the audience extraordinary women who marked their lives. We discovered that behind them there is a migration history of a mother, or a grand-mother a bit adventurous, open-minded , pioneer, who pave the way to their curiosity towards other worlds and countries. In the next week we are going to publish and share this interesting stories. Here you can find already the Natalia Boffi’s testimony dedicated to her grand-mother. 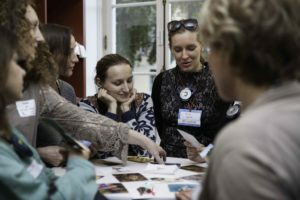 The intercultural games and animations allow an immediate sense of intimacy between the participants triggering discussion and dialogue. The dialogue, in its etymological meaning, remind us literally of a speech that is flowing through. We hope that the JAA Club/VDL events contribute to a rich exchange of views always driven by an open and curious non-judgemental mind set so to have a proper dialogue between the different cultures and communities. How to join the events and meet the ambassadors? Our next event will be at the Lëtzebuerg City Museum on the 19th of April at 17h30. You can join by registering here. We also remind that the JAA Club ambassadors are at your service every Tuesday from 8.30 am to 2.00 pm at the “Service d’intégration et besoins spécifiques” of the City of Luxembourg, should you have any question about your integration process to Luxembourg. You can find more info about the JAA Club activity and other integration association here.